Sitecore provides easy to follow Security Hardening Guides which contain instructions on how to setup basic security for production sites. Unfortunately it seems that even certified Sitecore partners don’t always follow these guidelines, which provides hackers with attack vectors unique to Sitecore installations. The following article is mainly aimed at Sitecore 6.4 and earlier. Code samples are based on C# 4.0. Disregarding the recommended security settings can have unpleasant consequences, mostly due to the fact that Sitecore contains web accessible administrative tools. Unless you’re running Sitecore 6.5 these tools default to being accessible by everyone. 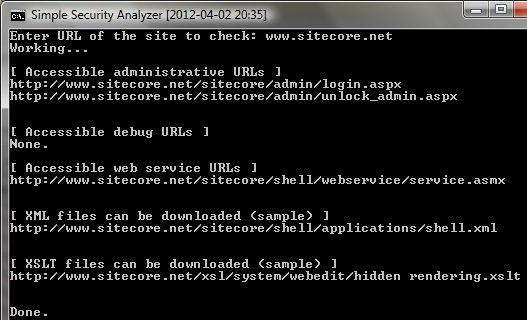 For example, “/sitecore/admin/showconfig.aspx” is a tool for checking the contents of the Web.config file. It displays the “finalized” Web.config, containing all changes merged from configuration files in “/App_Config/Include”. It’s great for debugging, but shouldn’t be left accessible for unauthorized visitors. Sites advertising the use of outdated Sitecore versions, possibly containing well documented security flaws, are open invitations for attackers. Even seemingly protected interfaces like the Visual Sitecore Service (which requires a username/password combination) provide ample opportunity for misuse. Many companies use email addresses or email address prefixes as usernames, and it’s fair to assume that at least some authors use “simplistic passwords” for their Sitecore logins, thus making “VerifyCredentials” an excellent option for brute force attacks. The configuration shown below prevents unauthenticated users from accessing administrative forms, debug tools and the Sitecore web service. It’s very simplistic and grants access to all authenticated users, even if they’re just simple customers, so a fully fledged production setup must be modified accordingly. // Don't follow redirects to e.g. login pages. We're only interested in "directly accessible" URLs. 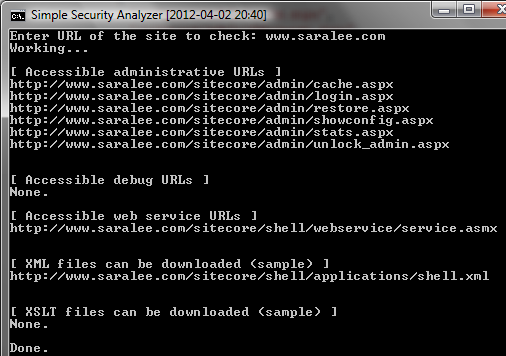 The URLs which Sitecore recommends protecting have been hard coded into a simple repository. In the example below they’ve been divided into groups based on their “type” and associated with a short explanatory warning. Below are some examples of sites powered by Sitecore, as advertised on http://www.sitecore.net/Customers.aspx. This entry was posted in IIS, Sitecore, Sitecore 6.4 and tagged hardening, security, Sitecore. Bookmark the permalink.